Red Skelton’s most famous character, Freddie the Freeloader, is a happy hobo clown. Unlike Emmett Kelly‘s Weary Willy tramp clown, Freddie the Freeloader had a perpetually upbeat personality, sure that good fortune awaited him just around the corner. He typically (depending on the need of the skit) lived in a ramshackle shack in the garbage dump, where he slept in a bathtub. Although it was a running joke that he didn’t bathe regularly. 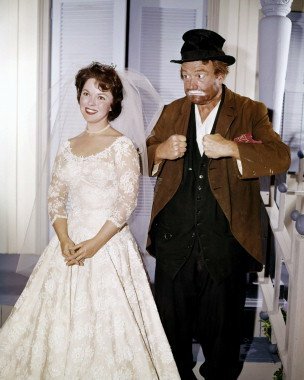 For instance, in several episodes of the Red Skelton Show, someone asked Freddie the Freeloader if he was alone. Freddie the Freeloader would scratch himself, pantomiming that he had fleas, and reply that he wasn’t totally alone. Freddie the Freeloader was a generous soul, always willing to share his meager possessions. For example, a guest star might need a place to stay, and Freddie the Freeloader would pull out another bathtub for them to sleep in. Other examples include his willingness to share his little food with others, help orphans with annual hobo fundraising efforts, or simply offer to help strangers – often to his own discomfort. In addition to his laziness, Freddie the Freeloader is remembered for his ingenuity, such as using the radiator of an old car to boil water for tea, or pulling a bathtub down from the wall as his “Murphy bed”. He had a genuine warmth and concern for people, especially for children or people in need. He was not, however, above deflating a pompous individual, or someone else that he felt had it coming, such as a criminal. One of Red Skelton’s best Christmas specials, with Vincent Price and Imogene Coca guest-starring. Highly recommended! One of my favorite Red Skelton episodes of all times. Based on O. Henry’s short story, Freddy the Freeloader is desperate to get arrested for 30 days (“30 days hath September, April, June and Freddy the Freeloader!”) to get refuge from the winter cold. But despite his best efforts, he can’t get arrested. Very funny, and very uplifting as well. Another classic Christmas episode, entirely in pantomime, where A lonely Freddy the Freeloader dreams that a rag doll comes to life, and the couple dances, skate and play … until the dream ends. A truly classic episode, where Freddie is entrusted by a “scientist” (Richard Deacon) to keep a “little black box” safe. Edward Everett Horton guest-stars as another hobo, and the pair of them are truly hilarious. Another Christmas episode that highlights Freddie the Freeloader’s generosity.